One of the most powerful creative techniques for any artist in any medium is recursion. In technical terms,. recursion differs from repetition in that what recurs is similar to the original iteration, but may be altered in some systematic way. Thus, for example, a mirror image is not a repetition of an image, but a repetition with a reversal. Perhaps the most common and obvious application of recursion is in music, where musical forms throughout history have relied on a theme and variations. Everything from 12-bar blues to a Bach fugue involves the statement of a phrase or theme, followed by the restatement at another pitch, or some other variable in a coherent pattern that allows the listener to anticipate the resolution or to grasp the internal form. Even Beethoven symphonies use "sonata form" which is, in essence, an A-A-B-A form. In visual art recursion is less of a fundamental or universal technique, but is nonetheless a powerful means of filling space with patterns that appeal to visual logic. Geometric design is often recursive, as in the Buddhist mandala images, or Islamic architectural elements. Architecture, especially, invitees opportunities for repetition and recursion as we see horizontally in colonnades and vertically in the erection of tall buildings of many storeys. Creating large or complex objects in SL is made easy by the ability to duplicate, rotate, and/or resize objects. 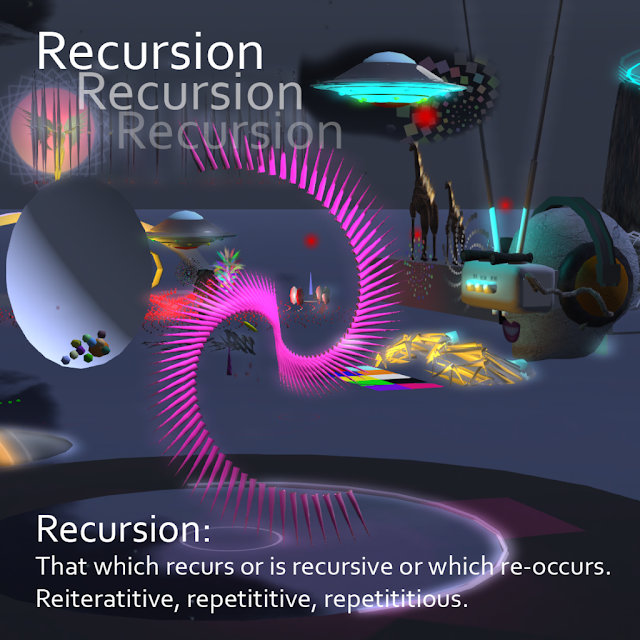 And such recursion is easily automated using rezzer scripts and building algorithmically.. Among the various recursive objects in the LEA27 sim are several that were generated from a script I developed to rez objects in a Fibonacci sequence. Mathematically, a Fibonacci number is generated from the sum of the previous pair of numbers (a recursive equation), starting with 1 or 0, thus: 1, 1, 2, 3, 5, 8, 13, 21, 34, 55, .... As it happens this sequence is seen often in nature (and approximates the "golden ratio") and so tends to have a pleasing "naturalistic" form. In practical terms, a Fibonacci angle can be stated as a value of approximately 137.5077641 degrees. Using this as a constant allows the simplistic application of recursion to create spiral forms. And by deviating from the constant, and adding a variable second axis, we can generate very complex recursive forms. I have created a device in LEA27 that does exactly that. The user has several variables to choose from, including angle, object type and size, number of iterations, and spacing. I have added ambient lighting controls as they seem less laggy and more intense than actually coloring the objects.